A few items currently on my wish list. I'm really more into beauty than fashion at the moment. I think that lip color would look beautiful on you! what a great set of pieces. I bet they must be so suitable for you. Hello, did u receive my e-mail? Oh I love that bag! Very elegant. The bath salts sound amazing too; I love a fancy bath product! The tote looks very nice, I have a similar one from H&M. I love candles but I have never seen the brand "Fresh"here... Candles with a cookie scent, oh Christmas time! To be honest, I'm not into fashion lately at all. I am coveting nothing at the moment. Hope the inspiration will come back soon. i have #2 but i don't think it's worth the price tag!! Very nice list! I hope you get something from it! Nice bag and nail polish! That bag! That nail polish. SO with you! Cool selection, I love the lipstick and the nail polish!!! i love the color of the nail lacquer! I love your wish list. I would also like to own everything on it. Great wish list. I love tote bags and that one is a beauty. I would also like to try the Beauty Counter Lip Sheer in Plum. Sheers are versatile, you can wear them 2 ways; sheer or darker by pairing them with a lip pencil. Ooo that bag is sooo luxurious! Haha I stopped in that Birch Box and spent some mula, got that Cynthia Rowley eye pencil. That store is so cool and only a few blocks from my job!! I want to try Charlotte Tilbury too! Her makeup looks amazing! I love that bag! Gosh, that lip colour is gorgeous! I love the tote bag!! Cute picks! wonderful picks, love 1 & 5! I love these soft, neutral colors. Very fall without being dark. 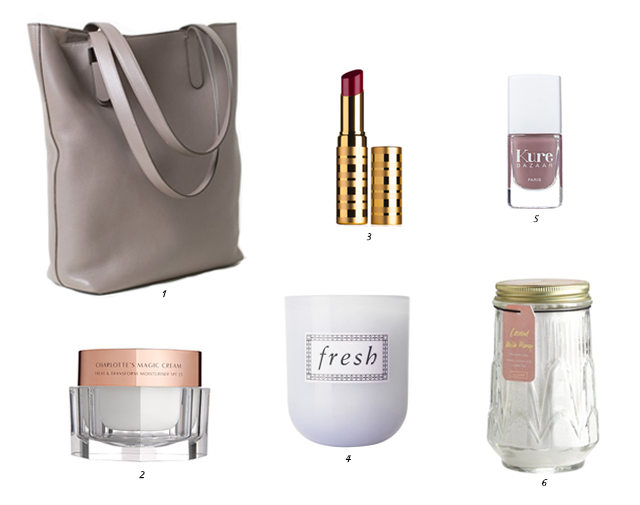 I have been eyeing that Everlane tote as well! Also, just ordered some red hued lip colors. Guess we are coveting the same things! Oh, I love that lip color! I've been seeing Charlotte Tilbury makeup everywhere since they launched in the US and I'm pretty curious about it. Loving the white purse even for fall! Very nice items! I like it so much. Have a fun Friday! I love it the number 2! Those bath salts look wonderful...maybe even more so right now because I really could use some relaxing down time!! I've never heard of number 2, very interesting! Ergh, you guys are so lucky you have Charlotte Tilbury readily available!! I'm currently lusting over some of her lipsticks, but can only get them imported from the States or from the UK! JEALOUS. The magazine tote looks so classy!